The Hotel taken over by Alexander Williamson circa 1858, was previously owned and run by Henry Bell, the inventor of the "Comet", the first commercially successful steam-ship in Europe. 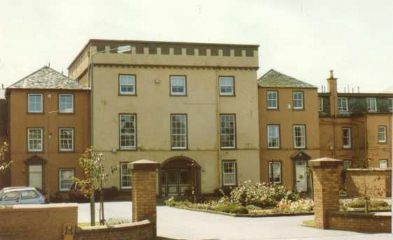 After his death, in 1830, the hotel was managed by Margaret Bell, his widow, until her death in 1857. The Queens Hotel building still stands on the sea front, in East Clyde Street, and although presumably altered since Henry Bell's day, and having been converted towards the end of the 1980's into luxury flats, it still bears the legend along the top of it's facade; - "The Queen's Hotel", and is still recognisable as the building shown in the right in a Joseph Swan engraving of 1838. Joseph Swan engraving of 1838. There are 3 other photos of the hotel on http://www.helensburgh-heritage.co.uk/ which can be found by following the gallery link. Further Detail on the Life on Henry Bell and his Baths Hotel. The following extract is taken with the author's permission from Brian D Osborne's "The Ingenious Mr Bell: A Life of Henry Bell (1767-1830) Pioneer of Steam Navigation". 2nd edition. Argyll Publishing, 2001, ISBN 1 902831 28 4s. The Bells' connection with the town seems to date from 1806 and he was receiving mail there in July and September of that year. In July of that year the Register of Sasines records that Henry Bell, Architect, of Glasgow, had feued on 29th May a piece of ground lying on the south side of the road from Dumbarton to the Kirk of Row.' This was the site of the Baths Inn. When Margaret Bell died in April 1856 aged 86 her obituary notice mentioned that she had been associated with the Baths Inn for forty nine years. This would suggest a date of 1807 for the opening of the Inn, which is certainly consistent with Bell acquiring the land in 1806. Bell's last appearance in the Glasgow Directories is for the issue of 1807, which again suggests that their move away from the city took place in that year. One assumes that if the Inn was built for Bell he would himself have acted as architect. Although established in business as an innkeeper Bell did not give up his other enterprises and continued to work as an architect, as for example in the reconstruction of the Dalmonach printworks in 1812. Bell used a wide variety of descriptions the re-registration document for the Comet describes him as "merchant of Helensburgh", while in a document for another ship in which he had an interest he is listed as "engineer in Helensburgh." On September 6th 1809 Bell advertised in a London newspaper The Star that he had " - . . now nearly completed that part of his extensive plan of the Baths, which he intends at present to execute." Certainly by 1810 the Baths Inn was well established. By May of that year, Bell had raised �00 by disposing of the ground, Baths, offices and buildings to the Glasgow merchant Archibald Newbigging.' It seems reasonable to assume that Bell's motive in raising this sum by a mortgage on his property was to raise funds for his steamboat experiments and eventually the construction of what became the Comet. The terms of the agreement would suggest that there was little chance of redeeming the loan in the six months allowed from Martinmas 1809 to Whitsun 1810. From that time forward the Bells no longer owned the Baths Inn though they continued to live there and manage it. The property, even in Bell's lifetime, passed through a number of owners and shortly after Bell's death one of his successors as Provost of Helensburgh, James Smith of Jordanhill, rented it from its then owner, John Lang a Glasgow lawyer. In 1820 and 1821 the property was repeatedly advertised for sale - initially at �00 - the building being described as a three storey block 50 feet by 51 feet. As shown in nineteenth century prints the Baths Inn was an impressive Square whitewashed building. From the advertised description the Inn was a complex building of some substance and character - a large greenhouse or conservatory and a coffee room were features of the ground floor while the second floor apartments were -1 6 feet in height and included a 27 foot by 16 foot dining room. The baths department was supplied with numerous hot and cold baths. The west wing was sublet to a private lodger. The whole property was completed with stabling for 22 horses, a coach house for nine carriages, a shed for carts and gigs and usual outbuildings. A further indication of the property is given by a Greenock Advertiser report of a fire at the Inn in 1821. In this report we are told that the fire broke out around 5pm on 12th June in the stables. The blaze destroyed all the outbuildings, but the horses in the stabling were saved although their harness was destroyed as were some pigs, doubtless kept to eat up the scraps from the hotel kitchens. The semi-agricultural nature of the establishment is reflected in the inventory of Bell's personal estate submitted to the Sheriff Court at Dumbarton after his death - the first item on this included among the household furniture, clothes, and moveable effects, "farm stock & crops". In 1821 John Galt, best known for his novels "Annals of the Parish" and "The Provost", published in Blackwoods Magazine a new episodic novel "The Steam-Boat". This was published in book form in the following year and concerns the adventures and travels of Thomas Duffle and the tales that he is told by his fellow travellers. Mr Duffle's early travels are by steamboat around the Clyde and in one of his journeyings, which are depicted in a mock-heroic style, the intrepid Glaswegian shopkeeper reaches Helensburgh and we get an account of the Baths Inn and its health-seeking clientele. Galt's description is brief but valuable for its contemporaneity. It seems pretty certain that Galt, who for a time lived in Greenock, just across the Clyde from Helensburgh, was writing from first hand experience and knew both Bell and the Baths Inn. 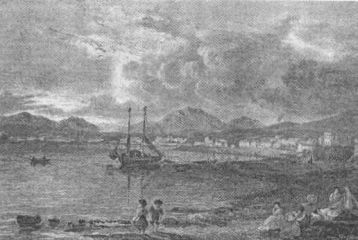 "When I had ate my dinner and drunk my toddy at the pleasant hotel of Helensburgh, in which there are both hot and cold baths for invalided persons, and others afflicted with the rheumatics, and suchlike incomes, I went out again to take another walk ..."
In the course of this walk Galt has his hero Duffle meet some Glasgow acquaintances, the McWaft's, and this passage has some interest as a contemporary reflection on the taste for seaside holidays which had been made possible by the coming of the steamboat and which would ensure the nineteenth century popularity of Helensburgh and other coastal resorts. The McWaft's had not settled at the Baths Inn but instead, like many other visitors, had taken a house in Helensburgh as their summer quarters. Their dwelling was a picturesque thatched cottage which however was equally typically, damp and inconvenient. Duffle is invited to come back to the cottage to pay a visit and Mrs McWaft.
" ... got out the wine and the glasses, and the loaf of bread that was blue-moulded from the damp of the house..."
"But the sea and Country air . . . makes up for more than all such sorts of inconveniences." Such enthusiasm for sea-bathing and the fresh air of the Clyde Coast was the making of the Baths Inn and ensured the growth and prosperity of Helensburgh during Bell's lifetime.
" . . . a six inch bore of water from the Burn of Milligs below the termination of the mill race of the Milligs Mill and of conveying the water by a Ditch or Cast ... down to the Baths for the use of the same or of driving a wheel to raise the Sea Water into the said Baths. " The Milligs Mill was just over half a mile north west of the Baths Inn. In 1823 Henry Bell placed an advertisement in the Glasgow Courier which suggests that the damage done in the 1821 fire had been made good and that the Bells were perhaps now looking more towards long term residents than to short-term holiday makers. THE HELENSBURGH BATHS, INN AND HOTEL have undergone a complete repair, and a good many improvements made to the Buildings, and are just now ready for the accommodation of the Public. MR BELL can accommodate a few LADIES and GENTLEMEN as BOARDERS on reasonable terms. Also, TWO PRIVATE FURNISHED LODGINGS, TO LET by the Month - the West Wing of the Baths, and the Cottage; each of them consists of a Kitchen and five Fire Rooms and Closets. H BELL is grateful for the kindness he has experienced, and the many favours he has received in his present situation, and hopes that the Public will countenance him as they think his merits deserve - as it will be his interest, so shall it be his study, to select his Wines, Liquors and every other article of the best quality. Comfortable Post Chaises, Steady Horses and Careful Drivers. MRS BELL, himself and servants, are determined to pay unremitted attention to the conveniences and comforts of guests. "Henry Bell, residing in Baths at Helensburgh, seized 14th June 1828 in six pieces of ground in East side of Bell Street and South side of Clyde Street... "
For once it would appear that the old adage about a prophet not being without honour, save in his own country, was disproved. Clearly Bell had, within his own lifetime, enjoyed the signal honour of having a street named after him. The street which commemorated him still remains and is now, more precisely, called Henry Bell Street and joins the main road through Helensburgh at the point where the Baths Inn, later to be renamed the Queen's Hotel, stood. For most of its time under the Bells' control the Baths Inn ran smoothly and successfully, an achievement which almost certainly owed more to Margaret's talents than to Henry's. It swiftly established a position as the town's, and the district's, leading hotel. By the end of Henry Bell's life, and to no small extent due to his work, Helensburgh had grown to have a permanent population of around a thousand but boasted a summer population of three times that number. "As seen from the opposite shore, it is a town dressed in white, and seems to be keeping perpetual holiday; and, in certain and not infrequent combinations of shade and sunshine, it appears to be a miniature Venice, a city of the sea, resting its edifices, with their clearly defined outlines, on the bosom of the burnished or silvery waters... Most of the houses have been built solely or chiefly as sea-bathing quarters, and are not unworthy of their pretensions to be a pleasant summer-home to the families of the plodding and wealthy merchants of Glasgow... At the east end is an elegant and commodious edifice called the Baths, where the luxury of immersion in any degree of temperature may be enjoyed. The town ... depends for subsistence almost wholly on its capacities as watering-place; and while joyous, bustling, and full of life during the bathing season, it fades away and languishes towards the approach of winter. . . The smallness and incommodiousness of the quay would seem to be a hindrance to its prosperity. Yet five or six steamers ply daily between it and Glasgow during 7 months of the year, making each three trips, one up and two down, or two up and one down in the day; and even during winter, 2 or 3 make daily trips, and keep up the communication; while there is almost hourly communication with the opposite port of Greenock, and thence by railway to Glasgow." However, during the latter part of Margaret Bell's long life the business of the Baths Inn declined and some glimpses of the operation of the Inn tend to confirm this. At the time of the 1851 Census Margaret was still running the hotel with the assistance of 9 live-in staff - a work force ranging from a cook, a dairy maid and a waiter to an errand boy. We may presume that there would have been additional non-residential staff, cleaners for example. However on the Census day the hotel could only boast of four guests, specifically two visitors and their two servants, which was hardly full occupancy for the eleven guest bedrooms- admittedly the Census was not taken at the height of the summer season. Although this represented a decline from the Inn's much busier earlier days, nonetheless the visitors that came to the Inn were of a very select nature. In September 1853 the local newspaper recorded among the new arrivals Capt Gwynn of the 2nd Life Guards and Mrs Gwynn as well as the Lord Advocate, Scotland's chief law officer. "From that time till her death Mrs Bell was hostess of the Baths Hotel, an inn of almost world-wide celebrity. It was for many years almost the only inn on the Clyde at all deserving the name; and not only was it a favourite for Glasgow people, who came down to the coast for a week or two, but for crowds of strangers, from all parts of the world, interested in Henry Bell and his proceedings. Helensburgh did not then include more than four or five indifferent houses, and the Baths, consequently was almost the only place of accommodation for strangers and visitors." The reference to Helensburgh's "four or five indifferent houses" usefully confirms the accuracy of Galt's 1820s reference to the holiday-making McWaft's seaside residence as a "thackit house . . . damp and vastly inconvenient". Mrs Bell was, as the obituary writer suggests, a very popular hostess, and long after Henry's death in 1830 the Baths Inn was still a place of pilgrimage for those interested in the story of the Comet and Bell. Indeed, because of the relics of the great man which his widow preserved, it became something of a shrine to his memory. "At the village of Helensburgh we stopped a little while to call upon Mrs Bell, the wife of Mr Bell, the inventor of the steamboat. His invention in this country was at about the same time as that of Fulton in America. Mrs Bell came to the carriage to speak to us. She is a venerable woman, far advanced in years." ".....presented with two engravings of the Comet, the first European steamer, by Mrs Bell, the venerable hostess of the Baths, towards whom she evinced particular attachment"
"In her girlhood ... the belle and toast of that rural parish, and till the very verge of her long life the evidences of her early beauty and vivacity were strongly marked "
" ... the widow of the celebrated Henry Bell, the man who amid difficulties, derision and discouragement was the first to propel a vessel by steam through British waters... She is to be interred on Wednesday first at one o'clock pm and we need scarcely hint to the steamboat owners on the Clyde that on that day they should carry their flags half mast high as a mark of respect to the memory of the deceased lady and her celebrated husband." It would seem likely that it was on her death or retirement that Alexander Williamson took over the hotel, re-naming it the "Queens Hotel". This is the record I have of the 1851 census for the Baths Inn. It does not quite tally with that in this extract, who is at fault I know not,!! 1851 Census (31st March) Helensburgh (503 ) Book 1. Page 25. Bath Hotel, East Clyde Street, Helensburgh.